The Power of “Yes” is simply seeing and engaging with opportunities that we are presented with. The Power of “Yes” is critically important because it keeps us moving forward. Not engaging in the Power of “Yes” we can become stagnant and stall in our momentum. This is where many businesses fail because the positive results seemingly evaporate. There is a drawback however. If we say yes to absolutely everything we create train wrecks with our calendars and lives. There is not room in our calendars for every opportunity and that is okay. So, why do we have trouble saying yes to opportunities? It may be that we do not want to make a bad decision because of past experiences. A be perfect script is also a common sticking point. What it really boils down to is fear. Fear of the unknown. Fear around trusting our own abilities to determine what opportunities are beneficial in which ones are not. When I was presented with the opportunity to speak at a TEDx event I was excited until I saw that date was right in the middle of one of my three day Breakthrough Business Mastery business boot camps. I had all of the normal reactions of how can I make everything fit. This could be a once-in-a-lifetime opportunity. Once I said yes I could then look at my options to fulfill both responsibilities. So, how did the opportunity to speak at TEDx occur. It was a series of yes’s. I said yes to an opportunity to invest in attending a business boot camp out-of-state and and joining a coaching program with a mastermind. I then met an individual at the mastermind who invited me to a meetup years later that I did not want to go to, but said yes. At that meeting I met another person who ultimately put me on the radar for TEDx. Saying yes to a series of opportunities seemingly not connected was magical. So how can we know which opportunities to say yes to? I developed a question that has helped me over the years to determine this. That question is: Does this opportunity lead me towards or away from my ultimate vision? An important piece to this question is knowing what your ultimate vision is. This question also allows you to check in with your own intuition which is usually quite accurate. Realize also, that when you say yes to an opportunity you are saying no to many other options. It is beneficial to know what those options are that you’re saying no to. 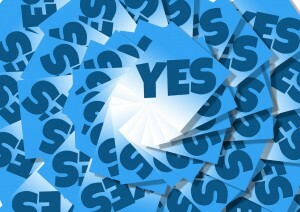 You can use these steps to determine your steps to say yes. Ask the basic question – Does this opportunity take me away from work towards my ultimate vision? Understand the opportunity as fully as possible. Ask specific questions so you don’t get caught up in an emotional decision. Determine what you’re saying no to. Remember some of the no’s that you’re saying no to at this moment may fit at a later time. Use your calendar to see if the opportunity fits without undoing other opportunities you have already said yes to. Make a decision! Accept or reject the opportunity. I have used this process in building my successful companies for over 30 years. By embracing some of these concepts you will keep your momentum and make this year the best year of your life!